Philippine President Gloria Macapagal-Arroyo vowed government support for the development of Bohol's tourist industry in a bid to make the province a leading tourist destination in the Visayas. The President made the assurance after she signed into law Republic Act 9345 at the municipal gymnasium here. RA 9345 converts the Panglao Island Circumferential Road in the Municipalities of Panglao and Dauis, including the Ambassador Panglao Suarez Bridge in Sitio Ubos-Totulan, Tagbilaran City, into a national road. The President inaugurated June 5 the Tagbilaran City-Lila section of the P784.9 million (US$14.86 million) Bohol Circumferential Road Improvement Project (BCRIP) Phase 2. 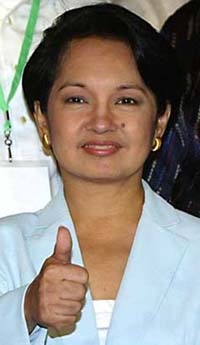 She said the multi-million peso road network will be a big boon to Bohols tourism industry and economic development. The House of Representatives' version of the bill (HB 3872), was authored by Bohol 1st District Representative Edgar Chatto. Governor Erico Aumentado, 2nd District Rep. Roberto Cajes and 3rd District Rep. Eladio Jala witnessed the President signed the bill into RA 9345. In her speech in Cebuano, the President assured the residents of Lila that once the BCRIP is completed in September 2006, she will prioritize another flagship project in the province — the construction of the Panglao International Airport. The President said it was important that infrastructure projects in the island province are upgraded to make Bohol more competitive economically, as well as ensure that adequate tourism facilities are in place to accommodate foreign as well as local tourists. Thanks largely to its tourism industry, Bohol is now among the progressive provinces in the country, she added. Bohol, the President said, used to be a 5th class province in Region 7. From 1,000 foreign and local tourist arrivals in the past, Bohol now boasts one million tourist arrivals every year. She said that once ongoing infrastructure projects in the province are finished, national roads and hotels, are completed soon, the number of tourists to visit Bohol will double to 2 million. Before the signing of RA 9345, the President inaugurated the Bohol Circumferential Road Improvement Project (BCRIP) under Arterial Road Links Development Project Phase IV, Contract Package 1 (Calape-Tagbilaran City-Valencia section). Upon her arrival here from Tagbilaran City, the President conducted a drive-thru inspection of the newly concreted Tagbilaran-Lila section of the BCRIP. She was also briefed by Public Works and Highways Secretary Hermogenes Ebdane Jr. on the various aspects of the BCRIP at the Lila gymnasium. Also present during the briefing were Secretaries Ace Durano of Tourism, Cerge Remonde of the government mass media, and Presidential Management Staff (PMS) and Presidential Adviser on Job Generation Arthur Yap and Aumentado. The Bohol Circumferential Road is the main trunk route with a total length of 260.7 kilometres covering the island of Bohol. Funded under the Official Development Assistance (ODA) of Japan through the Japan Bank for International Cooperation (JBIC), the BCRIP is being constructed by South Korea's Hanjin Heavy Industries and Construction Co., Ltd .